Passengers get on a cable car March 3, 2005 in San Francisco, California. 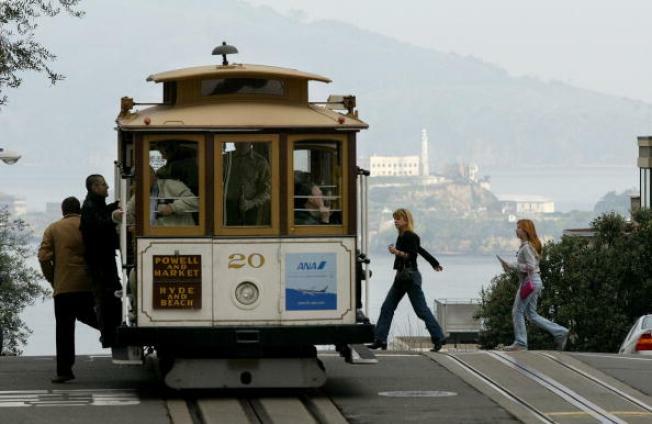 One of San Francisco's cable car lines will be partially shut down starting Monday as part of an ongoing rehabilitation and maintenance project, transit officials said. The partial closing will continue through Friday, according to the San Francisco Municipal Transportation Agency. The Powell-Hyde line will run from the beginning of the line at Powell and Market street to Jackson and Powell streets. Muni shuttle buses will make all regular stops between Jackson and Mason streets and Beach and Hyde streets as the SFMTA begins the second of three Powell line shutdowns this spring. Between Chestnut and North Point streets, the shuttle buses will detour in both directions. No stops will be made along the detour, transit officials said. Shuttle buses heading downtown on Wednesday between 6 a.m. and 10 p.m. will travel on Clay Street rather than Washington Street due to construction. Transit officials are advising motorists that the change in service may cause delays in the area and some street parking will be temporarily unavailable. Police officers will be directing traffic on site. One-way fare for all cable service Monday through Friday will be $2 - children under the age of 4 ride for free - and transfers will be provided.